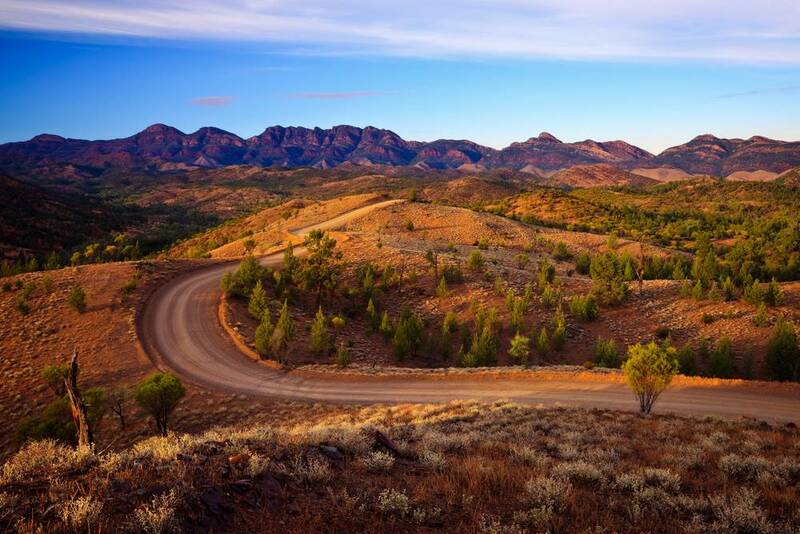 The Flinders Ranges are well-known for their iconic attractions but in the west, there are a bunch of overlooked destinations that you should definitely check out, too. Traversing through horse yards, along an airstrip and past some windmills, you will begin a steep climb to the trig point at the top of a hill. The first trig point’s 360-degree views make it a perfect spot for some photos. There are a few more great viewpoints as the track continues along the ridgeline before coming to a steep descent. Make sure to take plenty of care here. At the bottom of the hills there are a couple of creek crossings that require careful wheel replacement to avoid some washouts and you may need to do some track building to get through. The track loops around and climbs up onto another ridgeline for more 360-degree views. The Morlana Scenic Route starts right opposite the entrance to Merna Mora Station. The road follows the wide Moralana Creek before crossing it and heading up into the range. The next point of interest is the Old Cueing Yards that were used to hold cows for shoeing. The cows were used to bring large native pines from the Flinders Ranges for building projects. After 20km the Moralana road finishes at the Hawker-Wilpena road – turn left and head north. Rawnsley Park is 11km on the left and the turnoff to Wilpena Pound a further 18km. The Bunyeroo road starts with grassy plains covered with native pines and surrounded by bare hills. Soon the purple peaks of the ABC range takeover. Take a moment to appreciate it before descending into Bunyeroo Gorge. Once you’re there, you can drive up the creek bed, which has been carved out of the ABC range over 590 million years. Emerging from the Bunyeroo Creek, the road enters the Wilcolo creek valley, leading to a dramatic change in scenery with immensely steep hills, sheer gullies and pyramid peaks. Further along into the open and flat country and into a forest of native pines, after passing through a creek, the road ends at Brachina Gorge road. Brachina Gorge meanders through sawtooth ridges of resistant quartzite. This spectacular gorge is a great picnic spot. Continue through the gorge to the west.